When you shop at Raven Tree, you’re doing more than getting quality birding and nature products. You’re supporting a local business that is invested in the community, allowing us to grow and serve even more people (and wildlife!) Raven Tree is committed to environmentally friendly practices, education, and giving back to our friends and neighbors. We use recycled gallon jugs for seed sales, most of which are donated by local cafes and residents. Save your (clean and dry!) milk and water jugs and bring them in on your next visit to help with this green effort. Our bags are paper instead of plastic, and we reuse or recycle as much packaging material as possible. 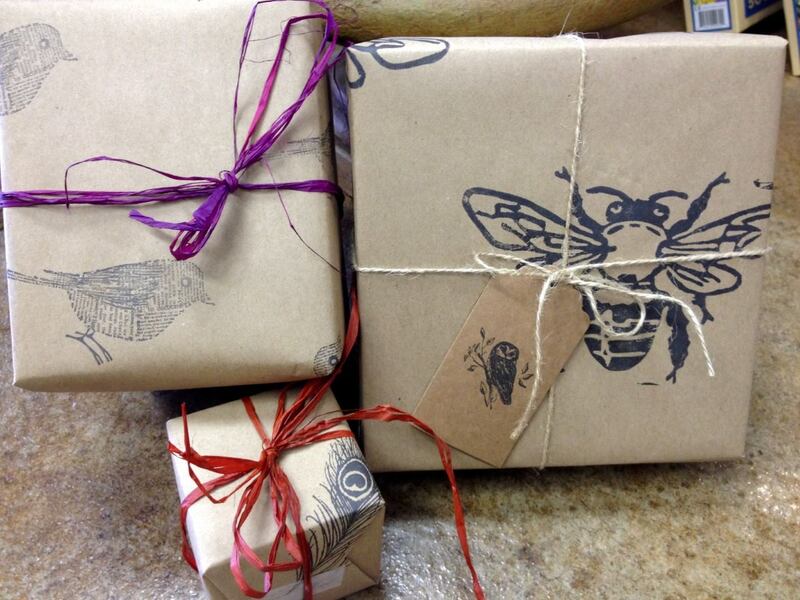 We offer eco-friendly, hand-stamped gift wrap, reducing the use of inks, dyes, and glossy paper. By stocking as many local and USA-made goods as we can, we reduce the environmental impact of long-distance shipping and lessen our carbon footprint. 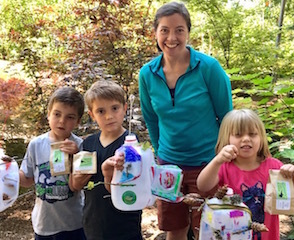 Raven Tree offers a variety of classes related to local birds and wildlife, as well as on-site talks and workshops at local schools, businesses, and community groups. Don’t forget to sign up for our newsletter to stay up-to-date on upcoming classes and workshops! If you are a school or community group interested in hosting a talk with Kendra Bainbridge, owner and Raven Tree educator, email or call us using the contact form below. We love talking birds, bees, bats– you name it! 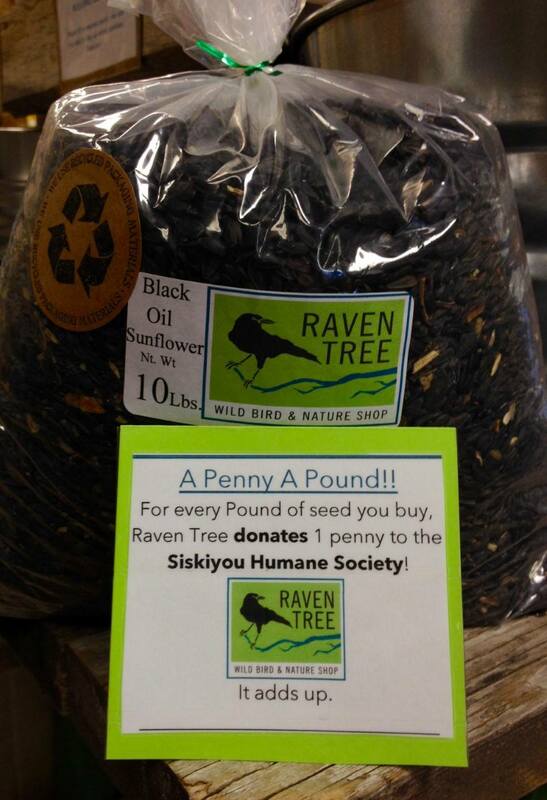 For every pound of bird seed sold, Raven Tree donates 1¢ to Siskiyou Humane Society. So far we have raised over $500 to help homeless animals! Our Second Annual Bird House Building Contest is now OPEN! Winning entries become silent auction items to benefit the Siskiyou Land Trust. Last year we raised over $600 in the auction and expect to surpass our gift this year! Contact shop for entry guidelines and details. We are proud to be part of the Siskiyou Co. community and are grateful to have the opportunity to partner with local organizations including the Mt. Shasta Chamber of Commerce, JEDI, Mt. Shasta Area Audubon, and many others who keep our community vibrant and connected. Raven Tree is more than a shop– we are a gathering place for a community of nature lovers. Thank you for your continued support!